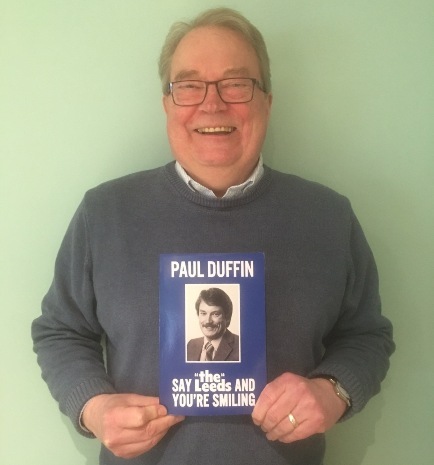 Yorkshire author Paul Duffin has launched his third book “Say The Leeds And You’re Smiling” on Amazon with all proceeds donated to Prostate Cancer UK. Paul worked for the Leeds Permanent Building Society for 21 years before it was swallowed by the Halifax in 1995. The book is a light-hearted and amusing account of his rise through the ranks at the Leeds. “Anyone who thinks office life is dull will have their view transformed during this journey”, said Paul. “It is also an inside story of the demise of a great Yorkshire institution”. The Leeds Permanent Building Society was formed in 1848. It merged with the Halifax in August 1995 with the new business launched as a PLC on the London stock exchange the following year. Paul started his career as a management trainee in Birmingham and rose to become a General Manager responsible for mortgages and savings at the Halifax. He retired due to losing most of his sight in 2002. He is now registered as having severe sight and hearing loss. The book is available on Amazon in both paperback and Kindle, as are his first two books, “Not Too Bad” and “And The Cricket Was Good Too” which have raised over £3,000 for Guidedogs and Sense (the deafblind charity).